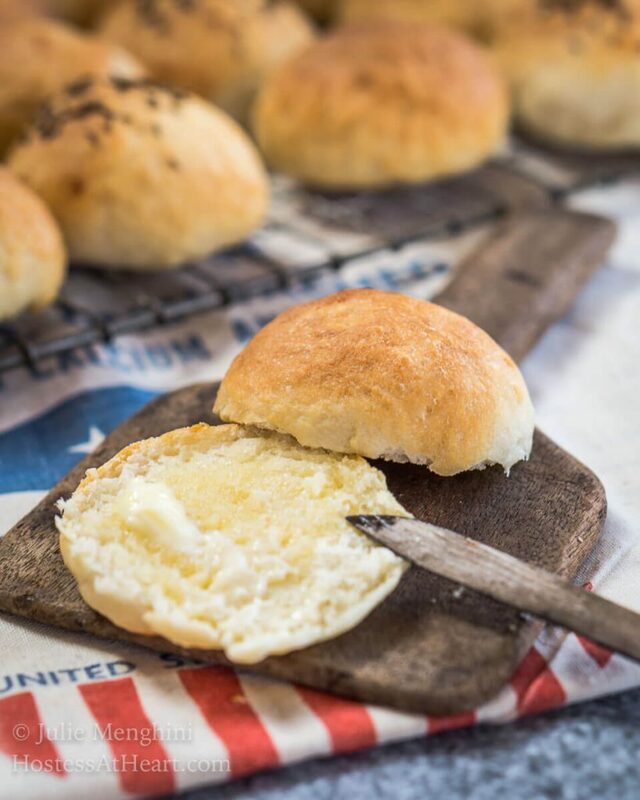 This Super Easy Potato Roll Recipe make a soft and slightly sweet bun that’s perfect for dinner or slider buns! Even the non-baker is going to love making them. Potato Bread or Potato Roll recipes are a must for St. Patricks Day. 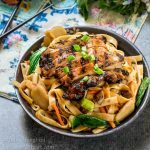 The good thing about this recipe is that it’s so versatile that you’ll love them all year long. I know that baking bread can be intimidating for people that have never tried it before or tried it unsuccessfully and are scarred for life. To some people, yeast is a scary ingredient. 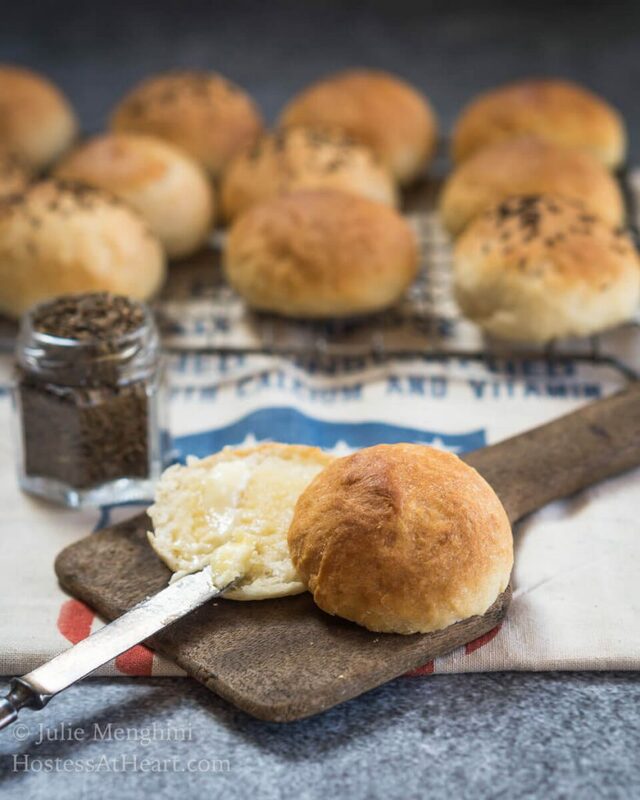 If you are one of those people, this Super Easy Potato Roll Recipe is for you! This month’s Bread Bakers group is being hosted by Wendy Klik of A Day in the Life on the Farm‘s post. She chose a very appropriate theme, Irish Bread recipes. Last year I made Soda Bread that is also super easy! This year I wanted to give potato bread a try. My sister had a potato bread recipe that I’ve been wanting to try. When I set out to make it there was an error in her instructions. I knew better but followed it anyway. She had written to start with a sponge and instead of adding 1 to 2 tablespoons or teaspoons of flour, she said CUPS! Well, that’s what I did and knew that was a mistake immediately. Instead of tossing the whole thing and starting over, I thought I’d see if it worked without starting with a sponge and just added everything together. With a few ingredient adjustments I ended up with was a soft, slightly sweet potato roll with a tender spring. When I make rolls or buns, I want them to all be about the same size so they cook evenly. I weighed the entire dough ball and then divided it by 34 which was the serving size on the recipe. These are small rolls but I could easily have made them larger and even into hamburger potato rolls. That’s exactly what I do when I make Brioche buns too. This size is perfect for sliders too. 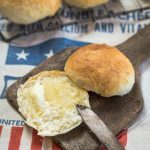 This Super Easy Potato Roll Recipe make a soft and slightly sweet bun that's perfect for dinner or slider buns! Even the non-baker is going to love making them. Boil potato in 2 cups of water. Remove the cooked potato, reserving water. Mash the potato and allow it to cool. You will need 1 cup. In a large bowl, add remaining ingredients (excluding optional butter or seeds) to 1 cup of mashed potatoes and 1-1/2 cup of potato water. If you don't have enough potato water add lukewarm water. Knead dough until soft. Add additional water or flour if necessary. Put dough in a greased bowl, cover and let rise 90 minutes. Punch dough down and form rolls. I used a scale and got 34 rolls weighing approximately 1.35 ounces each. 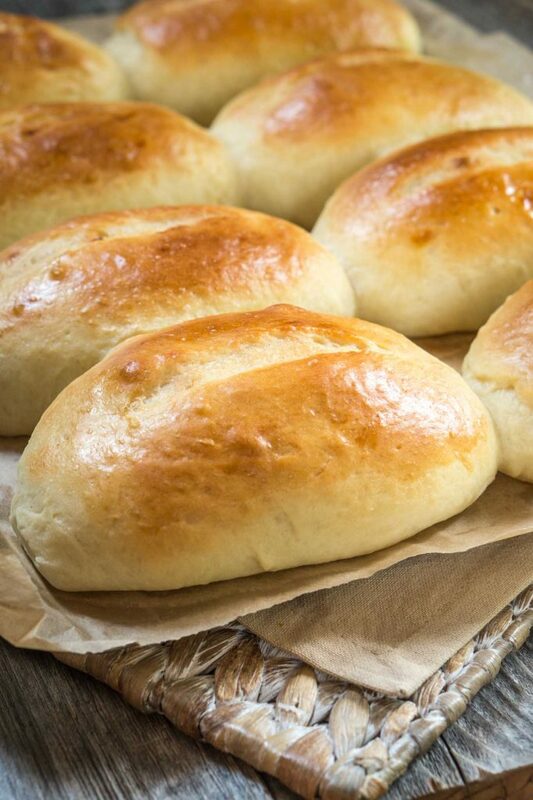 Put rolls on a greased pan. Cover and allow to raise an additional hour. Preheat oven to 350°F. Brush tops with melted butter and seeds. Bake approximately 20-25 minutes or until brown. Store at room temperature in an airtight bag or container. 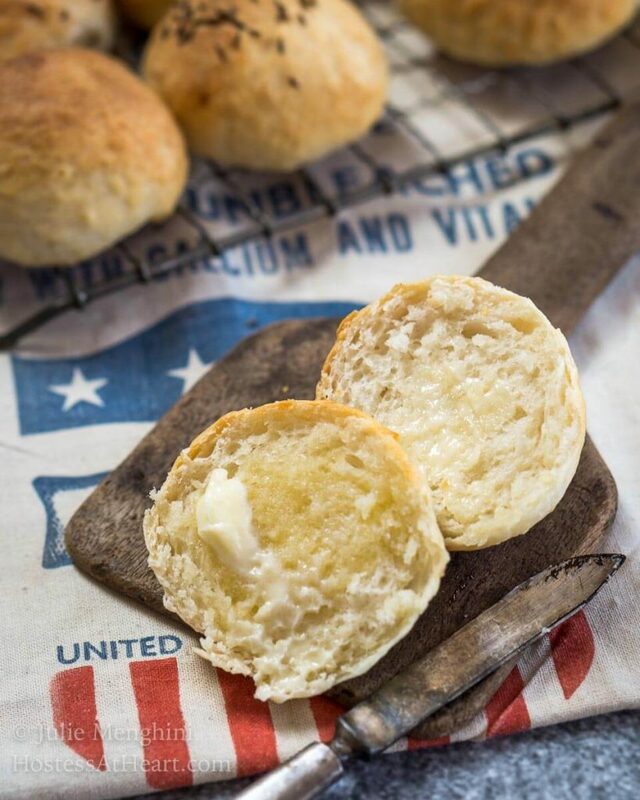 These are fresh mashed potato rolls. 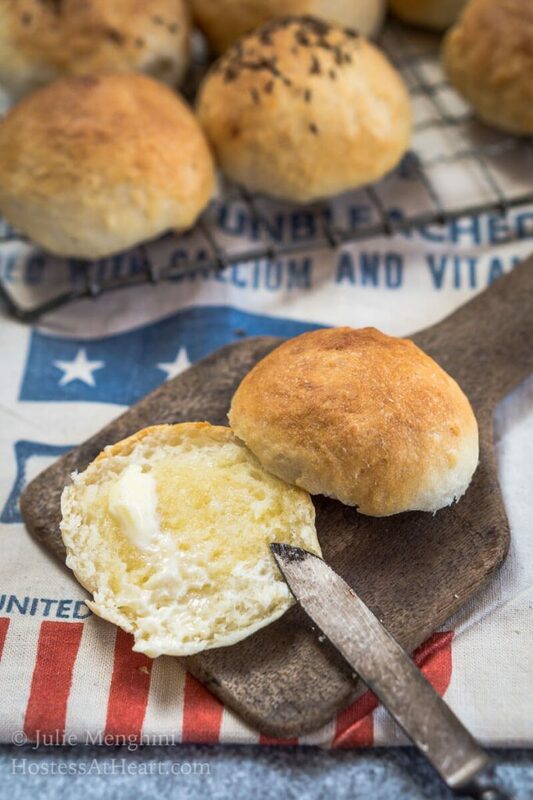 I’ve used potato flakes in rolls before but haven’t made a potato rolls recipe with instant mashed potatoes…yet. My neighbor stopped by and she ate the buttered prop for my photos and said they were like crack, which is a good thing. I sent her home with a bag for her family and told her to make sure her family got a few! Now it’s time to see what amazing recipes the other Bread Bakers came up with. If you liked this recipe, you’re going to love these too! p class=”p1″>Let’s keep in touch! You can find me on Pinterest, Instagram, Facebook, Twitter, and YouTube! Better yet, enter your email address in the box below and never miss a recipe! 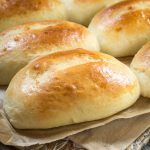 Could this recipe be used for hamburger buns? I know it says sliders but that’s a bit different from a full sized hamburger bun. It certainly can Sue and they would be delicious. You would just want to increase their size and I would just lightly flatten the round before the final raising after you roll them. I also use an instant thermometer to measure their doneness at 190°F. Please let me know if you have any questions. 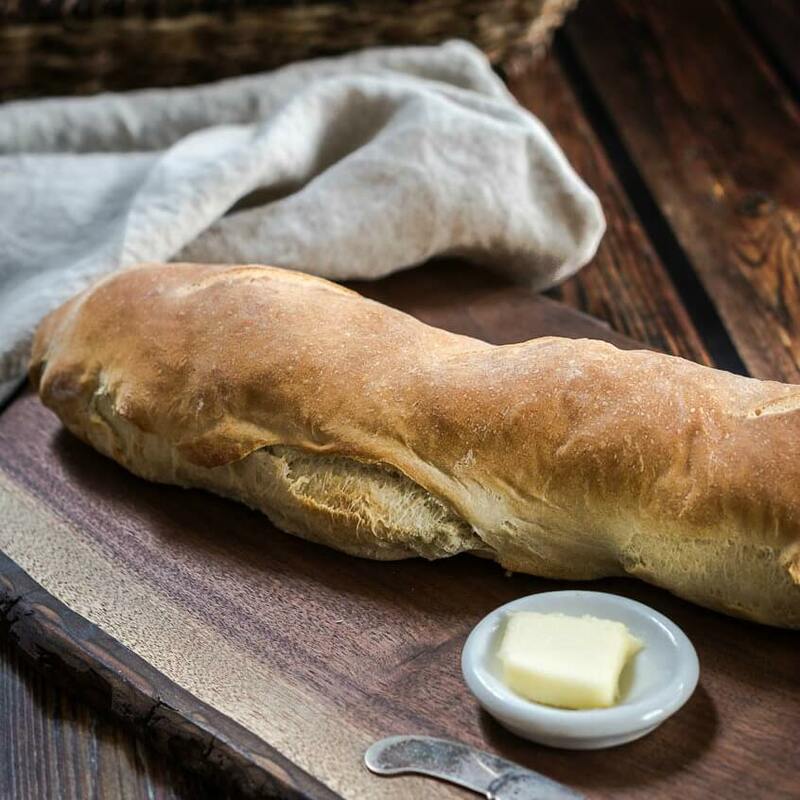 I’ve always loved bread recipes with potato – it makes for such a soft beautiful bread! Thank you Mollie! It sure made this bread light and fluffy! These look lovely and sound delicious as well. And great that you managed to get the slight error to work for you! Thank you, Caroline! Luck isn’t always on my side with baking, and I’m very happy that this one worked out. Thank you for stopping by! Good timing! Crisco is on my grocery list! These look amazingly beautiful! Those potato rolls look amazing. So soft and delicious. Thank you Pavani. We really liked them. Potato rolls are my favorite!! And it is so amazing to see how you made them look so gorgeous. The bottle next to the bread is super CUTE!! Loved every bit of this post Julie! Thank you, Susan! I did luck out on this one. I’ve had a few epic fails too LOL! This bread was soft and tender and we really enjoyed it. Potato Rolls was my favourite for its softness. Lovely presentation…….. Thank you Sharanya! I’ll definitely make them again! I love adding potato to my bread dough as it makes the bread super soft. The first time I made a potato bread, I landed up with a very sticky gooey dough as I had added too much liquid. The potato helps the yeast to ferment more. Now I.m careful. Will try the rolls out. Thank you, Mayuri! That’s interesting that the potato helps ferment the yeast. Maybe it’s the natural sugars? I just lucked out that my dough was so nice to work with. 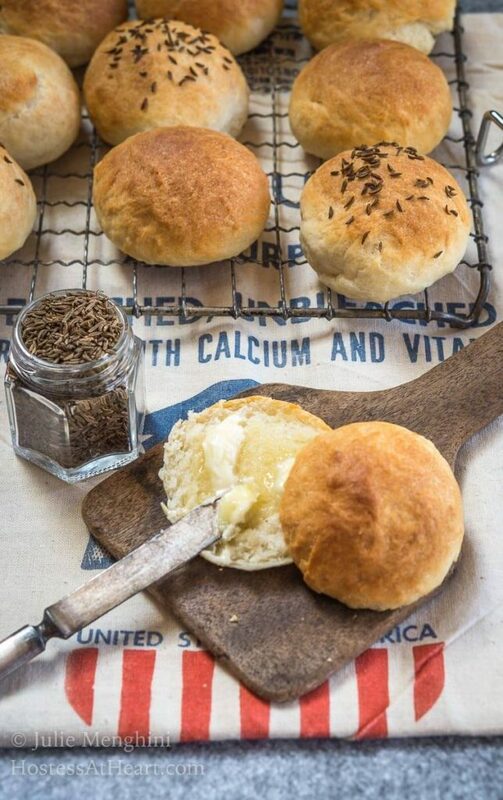 Simple bread recipes are always good especially when you spread lots of butter on them! I like the towel ? underneath. Thank you, Judi! I like simplicity too. That towel is actually a flour sack that I found at an antique store! I couldn’t resist. How cool that you rescued that sponge and ended up with these beautiful rolls! You are a bread expert! I consider myself lucky on this one Karen. I will have to try the other method next time and compare even though these rolls really came out nice and were so easy. I would gladly share with you, Anne! Thank you! They were really nice and soft. Love any and all potato bread! Boy do those buttered rolls look tempting. I can see how soft the crumb is. Lovely! Thank you, Eileen! They did come out nicely especially since I really tried to screw them up LOL! I have never made potato rolls and I love them. I need to remedy that and this recipe seems perfect for that. Thank you, Wendy. This was a great theme this month and I’m loving all of the unique recipes. Thank you for coordinating it this month! I would certainly not be able to stop at just one of these little beauties! 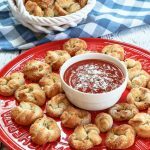 Potato rolls are one of my favorites to make and I haven’t done so it a while. My trouble is that I eat the whole batch. BY MYSELF. Luckily company is coming in a few weeks so I’ll wait until then and share the goodness! Thank you, Holly! I’m with you…give me more than one and don’t hold the butter! Thank you Jess! I was really happy with the way they came out. I’ve never made any potato breads, does it make the dough heavy? Actually no Elaine. They came out soft and tender and not heavy at all. 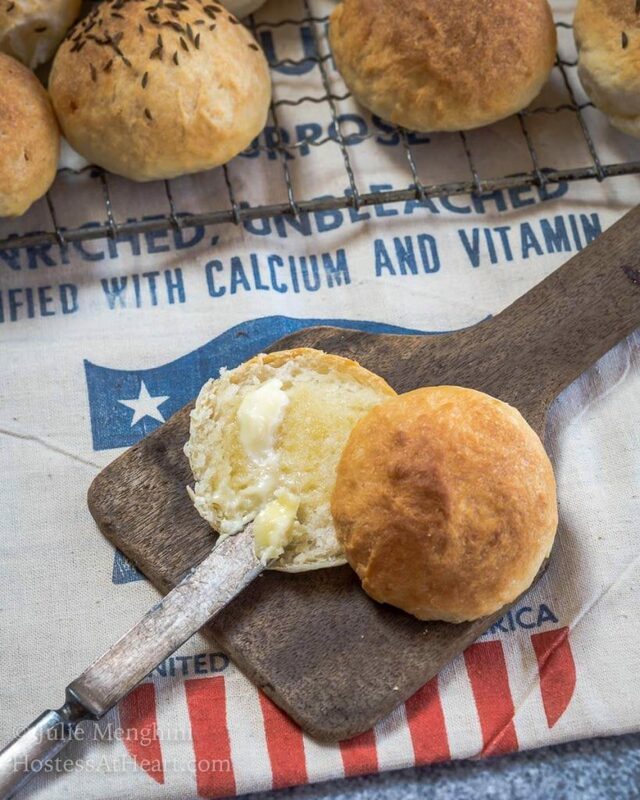 Bread is my favorite thing to bake but I’ve never made potato rolls (or bread). I love that your recipe will feed so many! 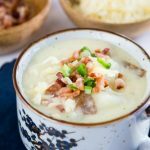 They’re perfect for St. Patrick’s Day or Easter brunch (since we usually have tons of family around at Easter). Thank you, Kelsie! I love baking bread too and John loves eating it LOL. I’ve put so many things in bread before and loved how these potato rolls came out. I think the mashed potatoes just added moisture and didn’t change the bread flavor. You could make them ahead and freeze them to feed a crown too. 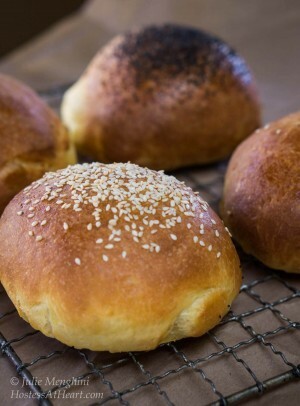 It’s interesting to discover the way you add the mashed potatoes and also the potato water to these buns. I can only imagine the scent of your kitchen! Thank you, Ana! They came out really good. I think the potatoes just added to the moisture. They came out really good. Thank you, Loretta. I’d rather have a foot of snow than freezing rain. It can be so damaging to electrical wires, trees, and hips! We were supposed to get snow and ended up with just a few flurries but no freezing rain thank goodness. It’s a good thing you’re not in NYC this week! I found that little knife in an antique store that I love to visit once in a while. I found a “butter pat” last weekend that’s just a cute little dish. I find it funny that people used to be even a little fancier than we are way back when.